Place taller plants to the north and smaller plants closer to the viewing area. As long as smaller types don't get too much shading, they can be placed between taller types. Accents, such as stones, pools, or branches can add appeal. Avoid salt water accents, as they often contain harmful minerals. Do not use limestone or basic rocks. In shallow or deeper water, bog plants give vertical accent to the water garden. These aquatic plants vary widely in leaf size, texture and form as well as height. On the edge of the pond they can be used to hide liner, tubing or a power cord. When planted in deep water in large containers, they provide a dramatic show in the middle of the pond. Refer to the depth requirement for each plant then install it at the correct water level. Plant directly into the soil of the bog plant zone or plant into the pot first, then lower it into the pond gently. Lower the pot at a slight angle to reduce muddying the water. Good quality soil is needed to establish high quality plants. The use of subsoil, sand or gravel in place of topsoil will diminish growth and make the plants susceptible to damage by aggressive or large fish. Heavy and rich loamy/clay topsoil from a flower bed, vegetable garden or lawn makes the best potting media. Sift out organic components that may float to the surface of the pond if you will be planting on pond ledges. Those who live near marsh areas like the wonderful Holland March in southwestern Ontario, will do well to purchase some bagged marsh soil! Plant in as large a container as possible to allow the bog plants plenty of room to spread and bloom freely. Some plants have spreading root systems that need adequate surface area but not much soil depth. Others have a dense clumping habit that may require less surface area. When placing a potted plant on a shelf maintain the required planting depth by raising or lowering the pot as needed. Use a pot with NO holes in the bottom. Fill the pot loosely with soil, place the appropriate fertilizer tablets into the bottom half of the soil and cover them over. Place the roots near the surface of the soil then add a small amount of soil to pack around them. 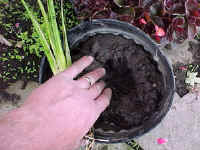 Gently compress the soil into place to anchor the plant. Leave about a half an inch of space at the top to add a layer of small gravel to keep the fish out and the soil in. For ponds with large fish, use larger stones or a Plant Protector. Take care not to cover any growth tips with stones as this will hinder growth. Container grown aquatic plants need to be repotted every two or three years to keep the soil fresh and able to support the plant. If the plant has jumped over the edge of the pot, or if it has broken through the pot, it can be re-potted to keep it in bounds. There is no harm in allowing the plant to grow outside of the pot except that it tends to be top-heavy and difficult to fertilize. At left is an example of planting between the stones around the perimeter of a pond. For planting directly into the soil a bog area, you would plant as you would any other perennial. Resist the urge to plant too closely! While a good soil is important, fertilization using tablets will ensure flowering and healthy growth. Without fertilizer, weak growth results in disappointing plant performance. 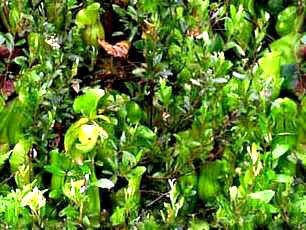 Most bog plants will require fertilizing 1 to 3 times a year.